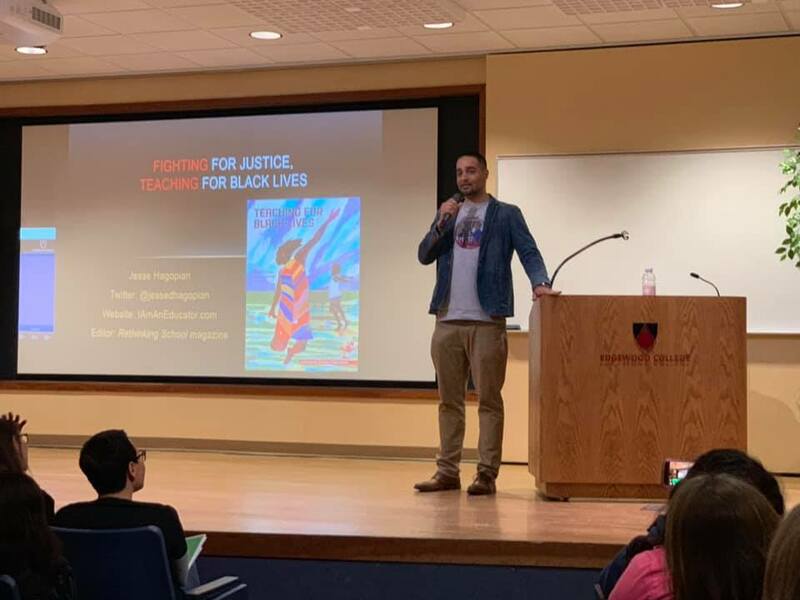 Last Sunday, over 200 Madison educators and community members gathered at Edgewood College to learn from Jesse Hagopian, public school teacher in Seattle and co-founder of the National Black Lives Matter at School Week of Action, for a talk titled “Fighting for Justice, Teaching for Black Lives” (endorsed and sponsored by the TAA). In his presentation, Jesse talked about the continued anti-Black racism that exists in public schools nationwide and that makes such a week of action necessary. Jesse talked about the demands of the BLM at School Week of Action and about how school districts across the country, including right here in Madison, are signing on to the Week of Action to center the conversation on racial equity and on affirming the lives of Black students. Following Jesse’s talk, educators broke out according to grade level to share curriculum for the Week of Action and to workshop lesson plans. The talk was an inspiring kick-off for this week’s Black Lives Matter at School Week of Action (Feb 4-8).